1. 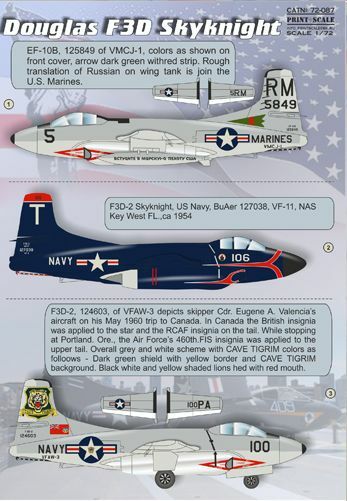 EF-10B, 125849 of VMCJ-1, colors as shown on front cover, arrow dark green withred strip. Rough translation of Russian on wing tank is join the U.S. Marines. 2. F3D-2 Skyknight, US Navy, BuAer 127038, VF-11, NAS Key West FL.,ca 1954. 3. F3D-2, 124603, of VFAW-3 depicts skipper Cdr. Eugene A. Valencia's aircraft on his May 1960 trip to Canada. In Canada the British insignia was applied to the star and the RCAF insignia on the tail. While stopping at Portland. Ore., the Air Force's 460th.FIS insignia was applied to the upper tail. Overall grey and white scheme with CAVE TIGRIM colors as folloows - Dark green shield with yellow border and CAVE TIGRIM background. Black white and yellow shaded lions hed with red mouth.